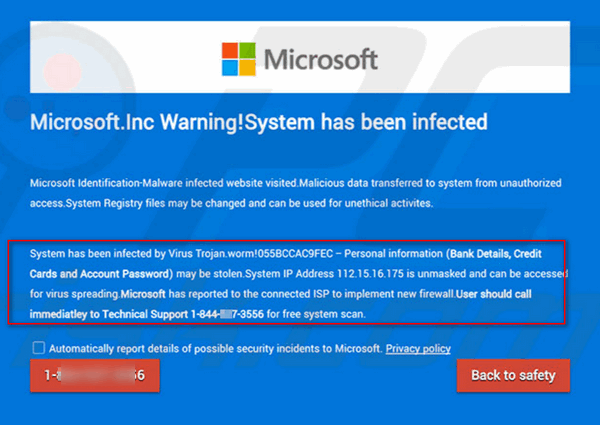 Above: A fake Microsoft popup warning of an infected system; a favorite trick of scammers. One of the most difficult things we have to deal with is when one of our readers falls for one of the many tech support scams that are ubiquitous on the Internet – the one we most frequently help people with is the Microsoft support scam where the victim either gets a phone call from someone claiming to be Microsoft and making them believe their computer is infected or spreading spam or malware – or when a popup window appears on their screen urging them to call a toll-free number because there computer is full of viruses and malware. Every week we get frantic emails from people who’ve been duped by these scams. Over the years, we’ve helped dozens of people get back hundreds of dollars stolen by these scammers and also helped them clean up their computers after allowing these scammers access to their computers. According to an article on the BBC website, these scammers were making over $1 billion a year by claiming to be employees of Microsoft and other computer related companies. THE MORE YOU KNOW THE SAFER YOU’LL BE. ‘This is an organised crime,’ Courtney Gregoire, an assistant general counsel in Microsoft’s digital crimes unit told the US newspaper. Donations help us continue our mission to keep you informed, separate the truth from the hyperbole, and help you stay safe online. We provide support to thousands of people; every week we help dozens of people via email at no charge. Thanks to your donations, we do a lot more than provide our free newsletters. We help you recognize online threats, scams, protect your online privacy, and provide you with the knowledge that can greatly help you navigate the Web more safely. We help you get more out of your PC.